OK, all you comics aficionados and connoisseurs exhausting yourselves searching high and low for a comics work that will push the boundaries of the medium while stunning your senses and remaking your conception(s) of self, for a work that you can really sink your æsthetic, emotional and intellectual teeth into, you have reached quest’s end – or should we say, la fin de la quête. 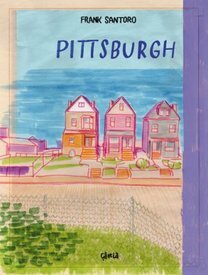 Frank Santoro’s Pittsburgh is a 224 page, beautifully printed and bound (by master printers in Latvia), full color (and what color!) hardcover published by Éditions çà et là in Paris, France (et, oui, c'est en français*). This book is comics like you’ve never seen them before. Each spread in this work is a fully realized composition in-and-of-itself, and each is then carefully woven into a tapestric, non-linear narrative that manifests an intuitive mimesis of the emotional states triggered by memories, and – crucially – by the memories of others as they are shared and represented in turn, some of which are being recalled and recreated from second- and third-hand sources, showing how memories of others memories, and of yet others’ memories, are all located in adjoining spaces in one's own memory and when recalled come alive together in recreating and representing our subjective reality, aka life as we live it. 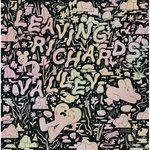 This is painting/drawing as comics as drawing/painting, a singular work, years in the making and a lifetime in the gestating. *Translation: and, yes, this book is in French (not English). Speaking of which, should any North American readers – francophone, or otherwise – like to get the French language edition Frank Santoro's classic, Storeyville, we now have it, HERE. Will there be an English language edition? Yes! New York Review Comics will publish an English language edition of Pittsburgh; the "street date" is 17 September 2019, and there's a good chance that it will premiere at SPX. NYRC has certainly established a solid track record in putting out volumes of excellent quality, and we are quite confident that their edition of Pittsburgh will be a worthy one. That said, it will be a challenge for anyone to surpass the production quality of the present, Éditions çà et là edition, which is a beauty to behold.